Home / Stock Picks / Dividend Stocks / Is Foot Locker, Inc. Stock Good for a Huge 50% Gain? Is Foot Locker, Inc. Stock Good for a Huge 50% Gain? Being a domestic retailer, Foot Locker, Inc. (NYSE:FL) and its business should be relatively insulated from the trade war fears ripping through the market. While Foot Locker stock certainly isn’t immune to stock market volatility, business shouldn’t see much of an impact there either. But is business so good that it warrants FL stock trading at $70, up almost 50% from current levels? I don’t know that it’s going that well. But that didn’t stop Oppenheimer analyst Anna Andreeva from slapping a $70 price target on the stock to go along with her buy rating. That move came March 5th, three days following the company’s after-hours report on March 2nd. Foot Locker beat earnings per share expectations, but missed on revenue expectations in its fiscal fourth quarter. While sales grew 4.7% year-over-year, comp-store sales slumped 3.7%, missing analysts’ estimates. It’s unclear what the issue is as Nike Inc (NYSE:NKE) just reported solid earnings, while Under Armour Inc (NYSE:UAA) seems back on track. Management is looking for just flat to upside comps in 2018 — and that’s dependent on a second-half boost. What if no second-half bump materializes? Then Foot Locker stock will be susceptible to more losses. And while Andreeva sees more upside, there have been plenty of other price targets post-earnings between a wide range of $43 and $58. But it still boils down to the second half. If it’s bad for FL, then its stock will have trouble rallying. I’m not trying to sound all doom-and-gloom here on FL stock. It in fact does have upside if it can recapture any momentum. As long as consumers are healthy (they are) and demand for footwear stays (it should), Foot Locker has the potential to do okay. On that front, analysts are looking for revenue to slip about 90 basis points this year before rebounding by 1.4% in 2019. Essentially, last year’s sales of $7.78 billion is forecast to grow to just $7.82 billion by 2019, a two-year span. On the earnings front though, analysts are looking for an 8.8% jump this year and another 7.6% gain next year. Growing earnings on flat revenue isn’t easy, but it would signal improved margins if Foot Locker’s able to pull off the feat — pun intended. The growth profile isn’t stellar, not by a mile. But we’re not really paying that much when it comes to valuation, which helps to lower the risk. FL stock trades at just 10.6 times this year’s earnings estimates and just under 10 times 2019 estimates. Further, Foot Locker stock pays out a ~3% dividend yield. FL is not the fastest growing, least volatile name to own. If you want to choose one that’s more stable, there’s a whole host of high-quality dividend payers to choose from. FL stock isn’t the best, but it’s far from the worst. So should we buy, sell or pass? Let’s see what the charts say. We’ll know soon whether Foot Locker stock has more upside or is set to head lower. On the five-year weekly chart below, you’ll see FL stock heading into potential resistance (black line). There’s also a developing trend-line of resistance that could give it trouble near current levels (purple line). 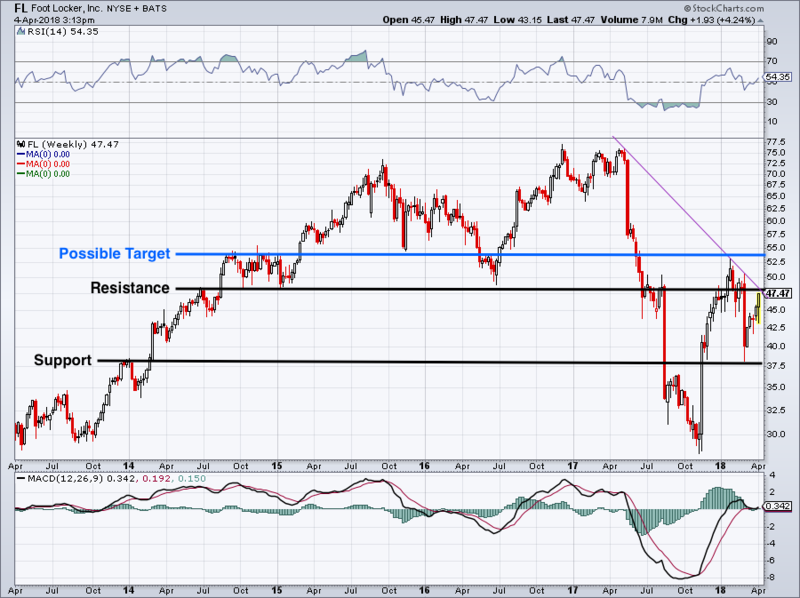 If these resistance levels give way, then it puts $52.50 to $55 back on the table as an upside target. Above that and Andreeva’s target starts to become more of a reality. However, should resistance put a halt on Foot Locker stock, shares could be heading back down to range support down near $38. Buying now is too risky for me, this close to resistance. If I’m buying Foot Locker stock, I’d rather do so on a breakout over resistance or on a pullback into range support. Article printed from InvestorPlace Media, https://investorplace.com/2018/04/trading-foot-locker-stock/.